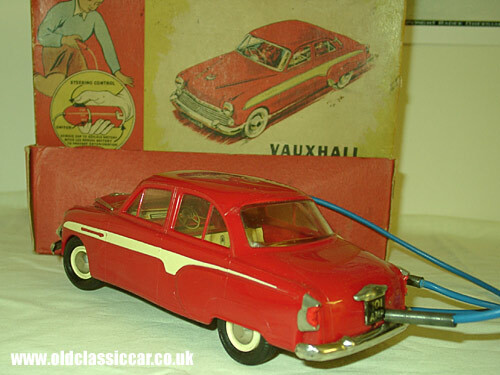 Again, the pictures of this interesting toy Vauxhall were sent in by Alan, who has this in his own collection of old toys. 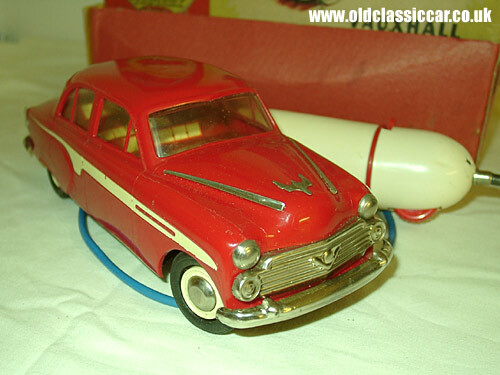 "The next one is a Welsotoys Vauxhall Cresta from the late 1950s. As far as I am aware this is the only decent scale car they made in plastic [model 101]. There was a friction powered one in a bluey grey plastic, but this one is more up market. It is about 8 inches long and 3 inches wide and has a metal printed interior. This, like most of my current models, came from Ebay where some [including this one] were being sold reluctantly. The batteries fit in the cream remote unit and the model wasn't working when I bought it, but it is now. The trim is chrome plated steel and fitted onto the body with fold over tabs, and the box has a shelf to fit the remote into." Before radio (and sonic!) control cars became popular in the 1970s, remote control cars were the 'in' thing with enthusiastic children. A battery and simple set of controls were incorporated into a handset, which would be connected to the model car via a length of wire. The operator would need to keep close by in order that the car could be 'driven' smoothly, without the cable snagging or running out of length. Old toys like this often received a lot of abuse, and finding cars like this Vauxhall Cresta, still with their original box, is getting trickier all the time.